Hello, friends welcome to Aviation Dreamer. Nowadays its really difficult to get a job as a flight attendant in any international airline. Because we don’t know the correct way to apply for a flight attendant or cabin crew. 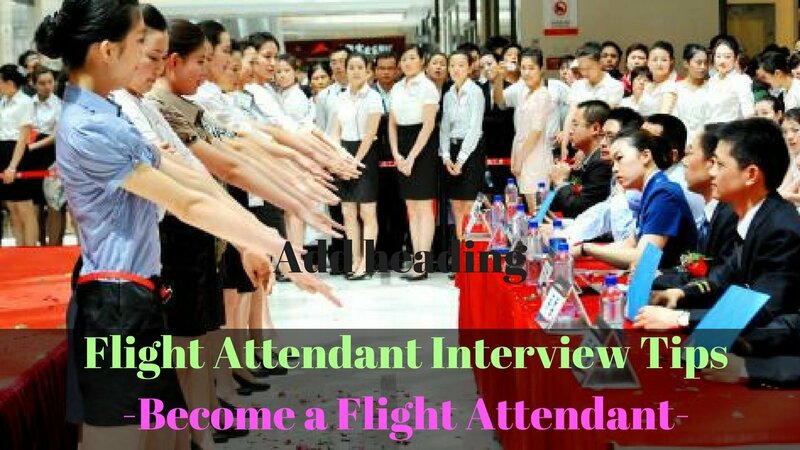 So, here I am gonna write on Flight Attendant Interview Tips to Become a Flight Attendant. Please don’t waste your valuable time more. Just prepare yourself and get the interview and get the opportunity. As I mentioned earlier, the work of a cabin crew attracts thousands of applicants from around the world. You will compete among the best fresh candidates, current and former cabin crew and people with high academic qualifications. Although you can join the high school certificate at the age of 18, due to demand, the airline is increasingly demanding and gives preference to college graduates. The minimum qualification required by a Czech degree holder with Thai Airways or Singapore Airlines (especially foreign candidates) is required. Most people have the effect of looking good (though this is a positive point), but I do not think it is mandatory. You will definitely get a job. Well, I can tell you how wrong you are. If you have this impression, then it will definitely fail. When airlines are recruited, they are looking for someone who can embrace and improve the corporate image of his airline. Therefore, you must have many talents, especially your communication skills, your preparation, teamwork levels and your passion for flying. So, how do you stand yourself during the interview? The first thing you should do is appear to be worth seeing. When the interviewer sees it, the first effect is counted and it is extremely important. So be sure to be properly prepared. Business clothes will be advised to wear and, please, some jeans, miniskirts etc. For a male applicant, I had worn a suit (well, I had done this, even though I was looking for an atrocity and a laugh between the rest). Trust me at that moment, you are watching all the time. The way you talk to, how you interact with others and how you behave. Do not trust too much, because you can leave the assumption that you are arrogant. Be polite, polite and polite to your interviewer and your fellow candidates. Your knowledge about the airline and flight attendant function will provide a great basis for the reference, which will naturally answer any questions. By answering the question based on your experience, you can provide stability and accuracy in your answers to make them. The key is to do your homework and read as much as possible about the airline you are requesting, such as Airline history, aircraft that fly and your destinations Below are examples of questions that will ask in your airline interview. Why do you want to become a cabin crew? What is the role of a cabin crew or flight attendant? Click here to check Airline Interview Question List. Thanks for People are bound to find this really important. Wow is all I can say. Thanks again.